There were purse bids today in Rome for third fight between EBU flyweight champ Silvio Olteanu and mandatory challenger Valery Yanchy. Rimer Boxe was the only bidder with an offer for 8,000 Euro and will promote the fight with date and site to be announced. Olteanu, 14-6-1, beat Yanchy, 21-3-1, the last time they fought and they drew the first fight with both encounters extremely close and difficult to score. Newly crowned EU middleweight champ Marcos Nader, 17-0-1 will make a voluntary defence of the title August 31 in Austria against an opponent to be announced. 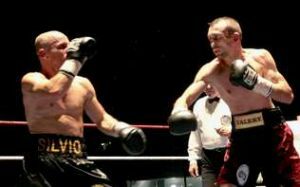 Nader won the title April 13 with a unanimous points win over Roberto Santos. Italian middleweight Domenico Spada, 36-4, has been official challenger for EBU middleweight champ Maksim Bursak, 24-1-2. The parties have now some time for private negotiations before it goes to purse bids.